EDGE is commonly used on field devices. A field device can be a laptop, tablet PC, USB drive, or SD Card. Download EDGE from the EarthSoft Community Center (ECC). Then refer to Unblocking Downloaded Files for instructions on extracting the contents from the zip folder. EDGE can be stored in any location on the device. Note: EarthSoft recommends unzipping EDGE to a folder where you have full permissions, such as the Desktop or “My Documents” folder. 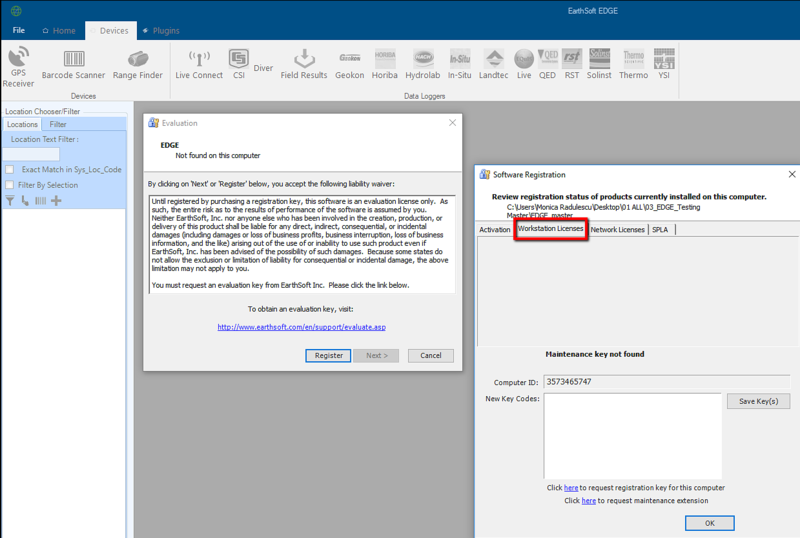 The following steps can also apply to an instance of EDGE extracted to a removable drive (USB flash drive, SD card, etc.). 1.Run EDGE by clicking Start_EDGE.exe from EDGE folder. Note: It may take a moment for EDGE to launch. Do not click the Start_EDGE.exe icon more than once. 2.A registration prompt will appear. Click the Register button on the Evaluation window. Note: The registration window can also be opened by clicking the EDGE application button in the upper-left corner of EDGE desktop and clicking Register. 3.Go to the Workstation Licenses tab. 4.Click the here hyperlink to request registration for this computer. 5.In the web form that opens, populate the required fields. In the message field, indicate an EDGE license is requested. a.Custom EDGE formats may open a different registration page, however, functionality remains the same. Note: Network licensing is not available for EDGE. 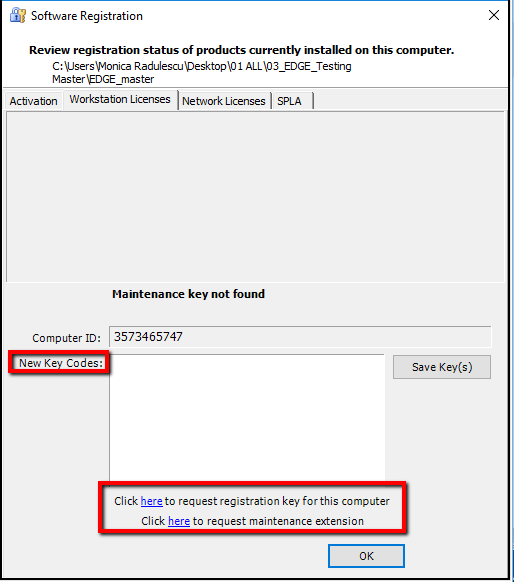 7.When a registration key has been received from the EarthSoft Help Desk, insert the key received in the New Key Code(s) text box in the Software Registration window, Workstation Licenses tab. 8.Click Save Key(s) to apply the registration string(s). 9.EDGE will load the EDGE format found in \EDGE\Formats\EDGE\EDGE.xse. To open a different format, click the EDGE application button, and navigate to that format's location. Note: By default, EDGE opens the most recently used format. 11.EDGE will also load the Reference Values File (RVF) found in \EDGE\Formats\EDGE\EDGE.rvf. To open a different RVF, review the RVF Selection article. To create new RVFs, review the instructions found in Create a Reference Values File. 12.Lastly, load data into EDGE using an EDD. More details regarding this process can be found in Open Field EDD. A Demo EDD is available in the EDGE folder to view and/or upload (i.e. EDGE_7.0 > EDGE > Tutor > EDGE_EDD Demo.xls). b.Select Send To → Desktop (Create a Shortcut). Note: Please make a copy of the EDGE.exe.config file after registering EDGE as this file contains the required registration keys. This file can be copied into future EDGE versions, making it unnecessary to register EDGE again on the same Computer ID. An updated Maintenance key may still be required.